It started with very early reaching to MITCoE around 8:30am. We soon rushed to main Auditorium to attend first day keynote by Dennis Gilmore on Delivering Fedora for everything and everyone. 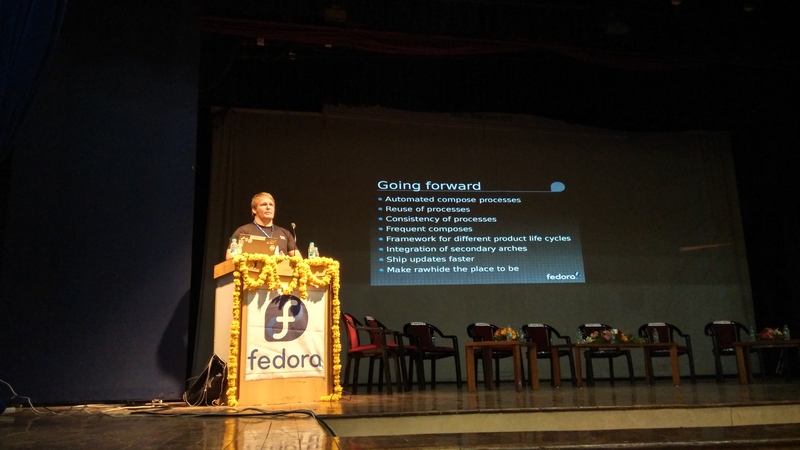 In his keynote, he talked about upcoming changes in future Fedora releases. I was surprised when I saw his last slide where it was written ausil. Reason of getting surprised was that, I have seen this name at lot of places in section “built by” in koji web interface while browsing through packages. It was good to see ausil talking on stage upfront. Keynote was followed by traditional lamp lightning by MITCoE professors and Amit Shah. Later, I rushed to the seminar room where I was supposed to give a talk on ABI Compatibility I kept my talks simple, basic and easy so that even students can understand as well. I started with API and how API changes in an application can affect all API consumers by demonstrating API change in C printf() function. Further, talked about how ABI of an application may change and can lead to wrong results or crashes in application. Also discussed how you can make use of tools like readelf, objdump, abidiff, abicompat to do ABI analysis on C and C++ binaries. Audience were interested in knowing if we can use these tools on application from other programming languages as well but sadly answer is No. Talk ended with showing demo about how Libabigail‘s abidiff tool detects ABI changes between two versions of a library. Talk was well accepted by attendees. 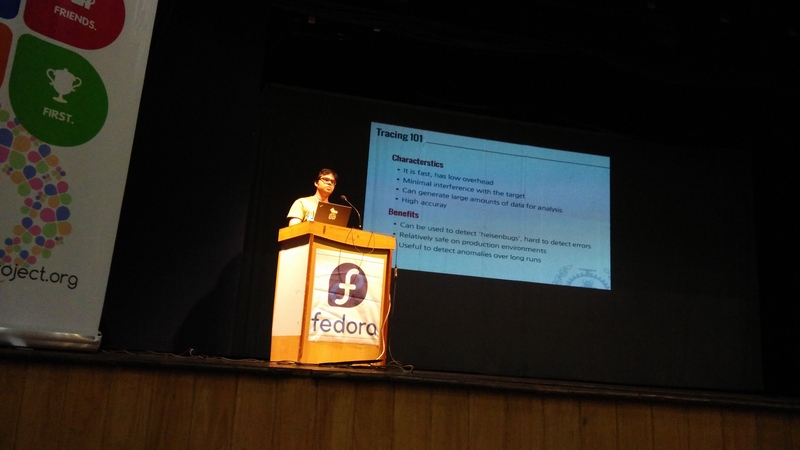 Next talk was presented by Samikshan Bairagya which was about ABI changes in Kernel. He talked about advantages and limitation of genkysyms tool which is currently being used in kernel for ABI checks. Later, he introduced us to new tool called Spartakus on which he is currently working on. Spartakus aims to solve limitations of genkysyms. He also welcomed new interested contributors to Spartkus. 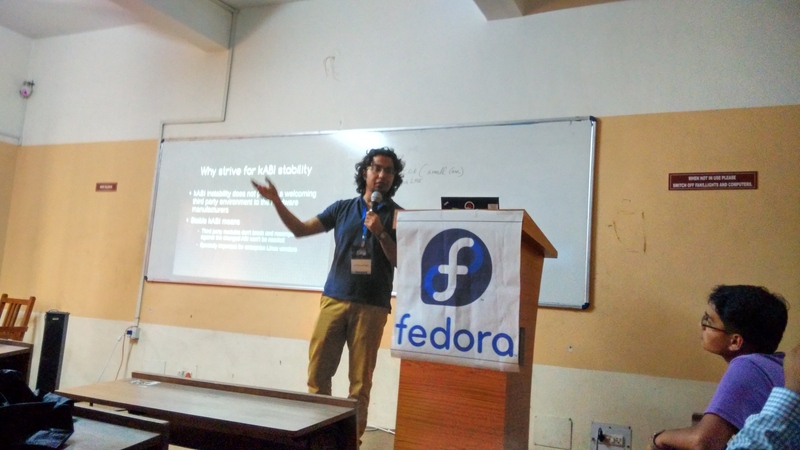 After the talk, I had a brief talk with Suchakra who other than contributing to Fedora does research and study in areas like profiling, debugging, OS and other low level stuff which interests me as well. I planned to attend his talks and workshop which was schedule on Day 2. Outside conference hall, there was Fedora booth as well from where we all attendees picked awesome Fedora swags like stickers, DVDs, badges. It was also a great place for different people to interact with each other and talk and ask for help if needed. 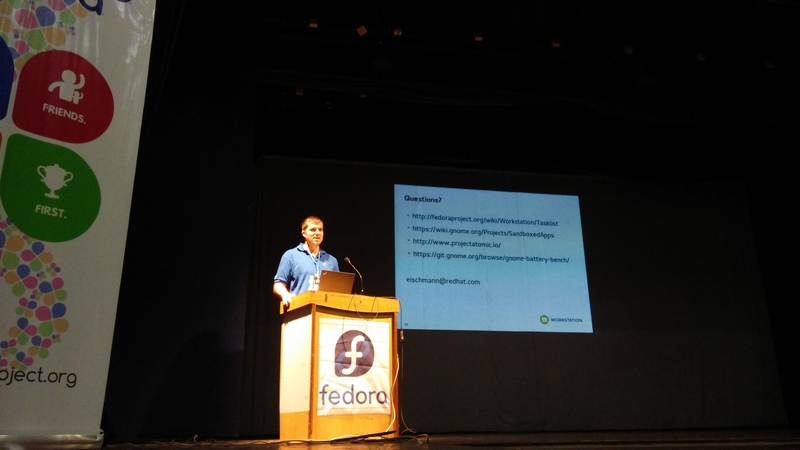 Day2 started with keynote by Jiri Eishchmann on current status and upcoming features in Fedora workstation. Everyone was thrilled when Jiri told in his talk that MP3 patent is going to expire soon and we can use it for free to play mp3 media! Further, I attended Suchakra’s morning talk on different tracing tools like LTTng, SystemTap, Dtrace which went very well. I also attended workshop on Kernel module development where I learned creating your own network packet filtering kernel module. Sadly, module didn’t compiled on my machine because of mismatch of kernel sub-packages versions. Error got fixed next day when I updated my whole system with new kernel sub-pacakges versions. 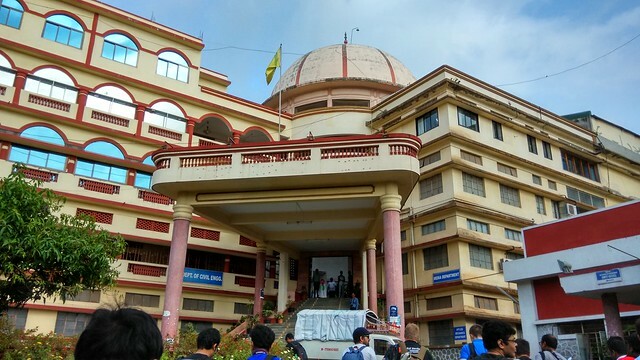 I attended introductory Docker workshop in morning which was lead by Lalatendu and Aditya. They did very well set-up for distributing Fedora vm with docker images already available in it. This avoided hassle of waiting for college internet for downloading on demand. Whole session was hands-on and that’s why I liked it very much. 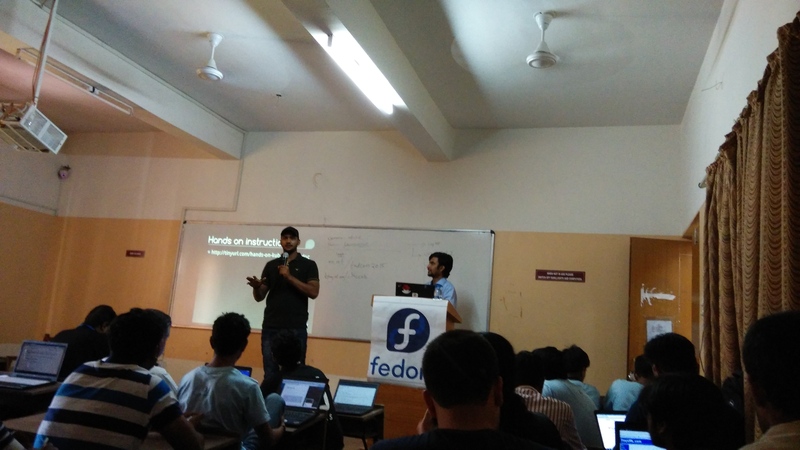 Further session was on Kubernetes which I attended partly and then moved to AskFedora UX/UI hackfest. I didn’t actually hack on anything related to UI/UX there rather was listening and noticing to what improvements they made and planning to do in AskFedora web interface. 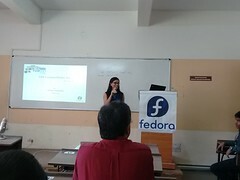 Day3 ended up with closing ceremony where Rupali expressed her thanks on behalf of all Fedora community to each group of attendees. I was amazed to see the enthusiasm of organizers and volunteers throughput the conference. 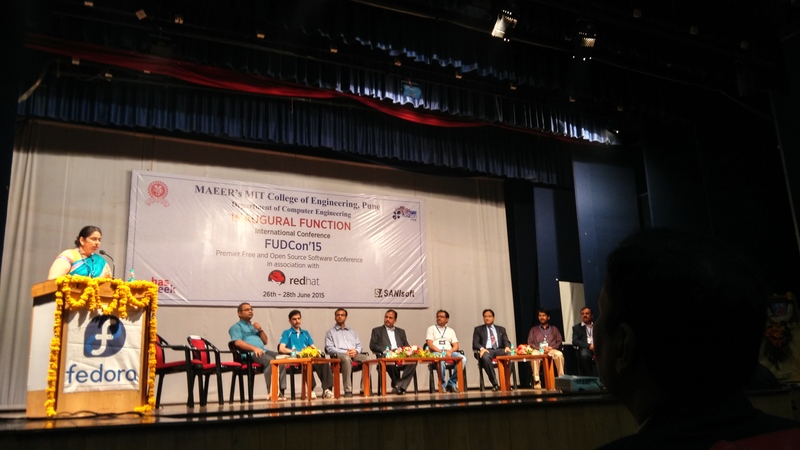 Both of them did a great job in making this FUDCon a grand success. 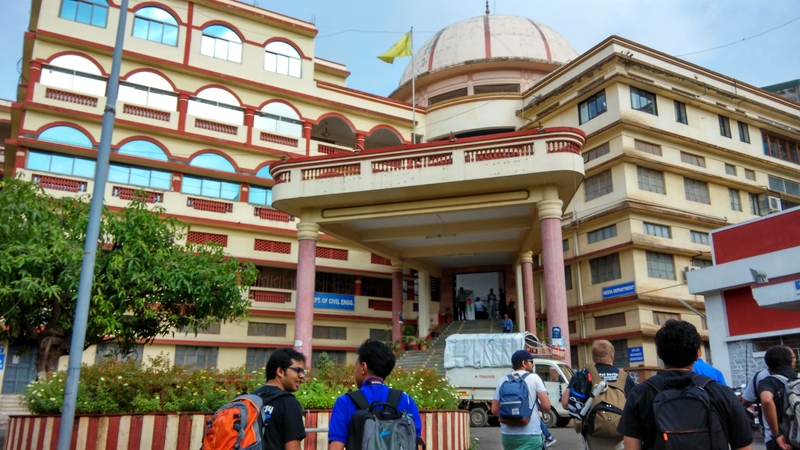 I would personally like to thank Fedora for approving my travel sponsorship request and providing a great stay in Pune. Few pictures which I captured is available on flickr . Will update with FUDCon talks videos link once it is available. In one sentence, “Another great conference” for me! Looking forward to be part of upcoming Fedora events and conferences. Great post Sinny! Thank you!